The Auto Inserter is the fastest, most efficient panel spacer insertion machine on the market. This machine was built to last and allow you to increase your production times. 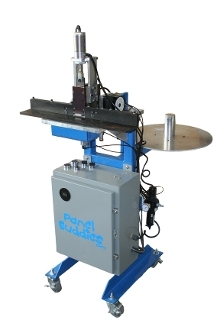 The Auto Inserter uses bulk rolls of Panel Buddies and cuts and inserts them into the bottom of the groove. Our machine has a small foot print, so it can be placed just about anywhere. Click this link to see a video of the PB1 in use! For additional information about the machine and lead times please contact us. Copyright © 2015-2019 Panel Buddies™. All rights reserved.